The month’s supply of SW Florida real estate inventory supply declined in July from April levels. There are many reasons for this which we’ll go into detail. Sellers are listening. Buyers’ motivation topped out about 9 months ago and sales suffered. We’ve seen instances in the past where buyers were at one level, and sellers were at another level, and there was a standstill. The longer the standstill, the longer homes sit on the market and inventory grows. This time around, word got out and sellers didn’t want to be caught holding the bag. They made the adjustments quicker, and it’s paid off. 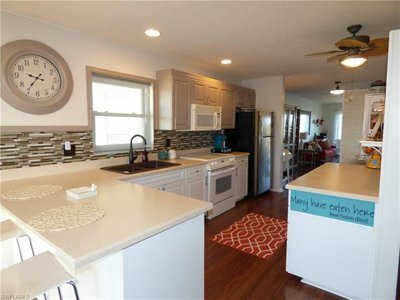 Sure, nobody is happy to reduce their asking price. Without movement, nothing would happen. If a seller’s true desire is to sell, then you’ve got to find that price point where price equals value in the market’s eye. It looks like sellers have been doing that. For the most part, inventory has declined, and sales have increased. 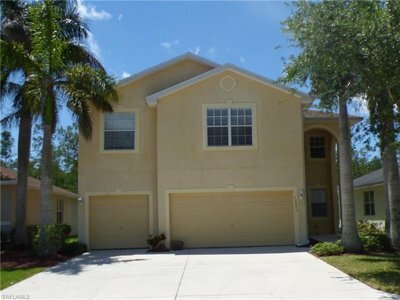 Inventory declined in all price ranges in Lee County Florida. 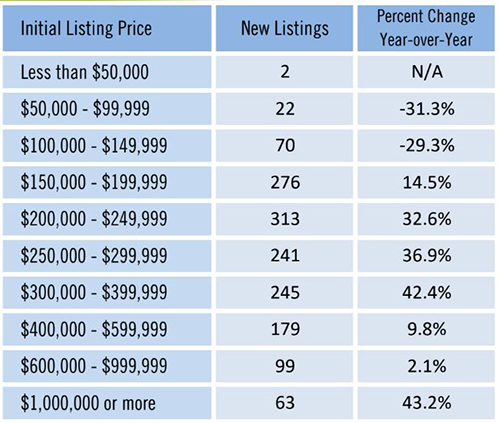 Closed sales increased in all price ranges except the less than $100k and $100-150k ranges. 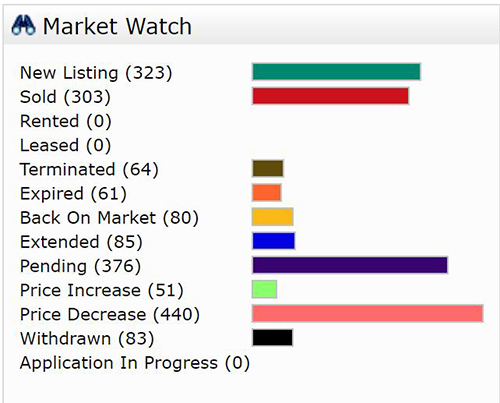 This decline could simply be a matter of not as much inventory to sell, therefore not as many closed sales. With months supply of 1.25 months or less, it’s hardly worth mentioning except to be factual. Buyers should take note. You’re no longer in the driver’s seat. 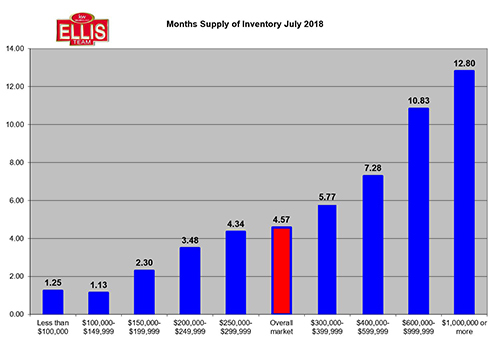 With 4.57 months’ supply of overall inventory we’re back to a seller’s market, statistically speaking. Sellers, don’t get too excited either. It really depends on which price range your home is located. Once your home crosses that $300,000 threshold you enter neutral to buyers’ market territory. If you’ve got a home that’s been on the market awhile, it’s probably time to adjust to where the buyers are. If you’re a seller priced under $300k and your home is not selling, there is a problem. An immediate adjustment may be in order. If it is priced correctly, it should be getting action. 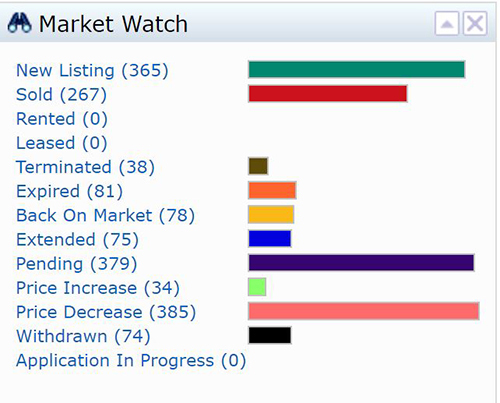 We tell sellers we should be getting offers about every 4-5 showings. If we’re getting showings and no offers, the marketing is working. The price or condition isn’t. If a seller isn’t getting showings, it’s either the price or the marketing. It could be both. As a seller, you’re really in charge of two things. Setting the correct price and selecting the best agent. 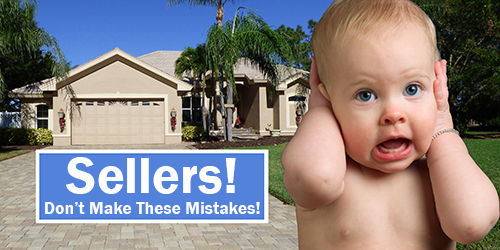 Mistakes in the MLS, bad photos, or lack of marketing muscle can be a turnoff to buyers or make your listing invisible. We’ve seen lack of good marketing cost sellers a sale, or thousands in their pocket at closing because they didn’t attract the highest and best buyers for their home. If your home is overpriced, you’re just adding to the marketing time and kidding yourself. Typically, in the end you’ll end up taking a lower price than you otherwise would have had you priced it correctly upfront. If your agent recommends taking action on price, listen. If you aren’t having that conversation with your agent, perhaps it’s time to be proactive. Perhaps your agent recommended a lower price at tie of listing, but you were stubborn or convinced it should be higher. Perhaps your agent has recommended price adjustments and you’ve declined. Whatever the case, ultimately, it’s on you as the seller. If you decline your doctor’s advice, the results are on you as the patient. If you decline your attorney’s advice, the results are on you as the client. The same is true in real estate. It’s your home. If you’re OK with owning it and not selling, then that’s fine. If you’re not OK and would like to move on, it’s time to adjust. It’s either the marketing or the price. If your home has expired, or if you’re considering putting your home on the market, perhaps it’s time to get a 2nd opinion. Always Call the Ellis Team. We specialize in getting homes sold the 1st time. We’d be happy to look at your home and figure out what we can do to sell it. 239-489-4042 Ext 4 or www.LeeCountyOnline.com Ask for Sande or Brett Ellis. We were having a one on one training session with one of our agents this week and the conversation came up about summer home sales. 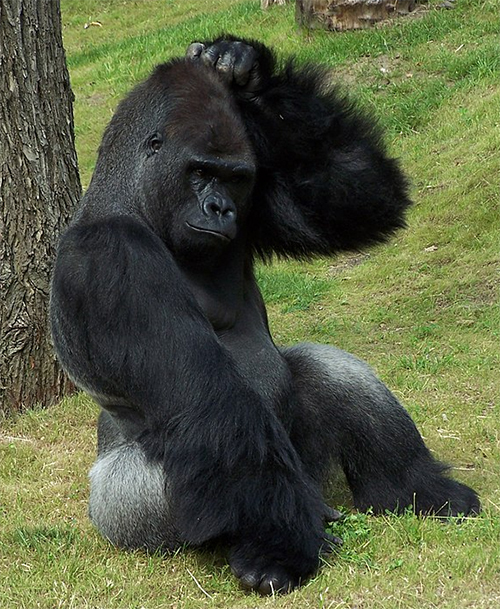 He was excited because he thought this summer was going to be good for home sales. And yet, so many agents out there talk about spending summers up north and taking time off because sales are slow in the summer. Their perception becomes their reality. 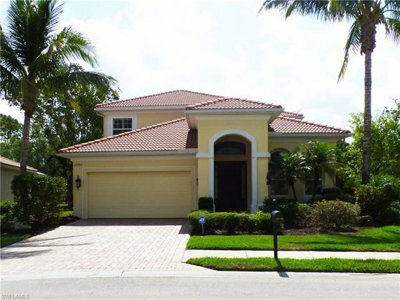 Read on to find out why summer great time for Southwest Florida home sales. If they believe sales are slow and take the summer off, sure enough, their sales will be slow to non-existent. And they will be right, and their decision to take the summer off will have been justified. Over the years my mother Sande and I would just laugh, as we raked in sale after sale in the summer. For us, year-round sales were good, and summer was better. I went back and looked at MLS sales stats from 2000-2003. 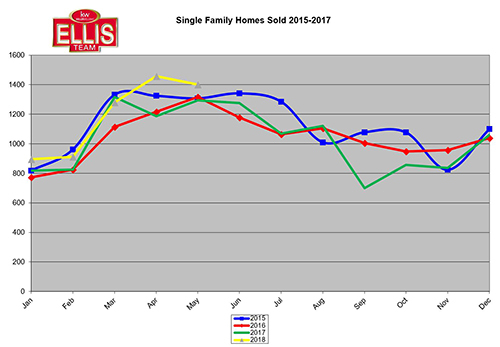 As you can tell, home sales would begin climbing in Feb and generally peak during the summer. After 2005 we began a steep decline in prices which ultimately led to the foreclosure crisis. This article isn’t about all that. We have plenty of other articles on our Blog about that. During the recovery, the typical home buyer changed. We see signs that we’re returning to the normal home buyer process. It would be too easy to assume that all home buyers relocated from up north. For a period, it seemed that way, but things are not always as they seem. 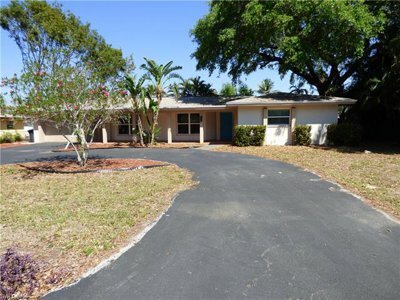 Traditionally Southwest Florida homeowners made their moves in the summer. They owned businesses or worked in the service industry and were quite frankly too busy in season to think about moving. Kids were in school, work was busy, and buying or selling a home couldn’t be the top priority, until summer came. Keep in mind, summer is the busy selling season up north too, so any relocations were dependent on that sale up north. 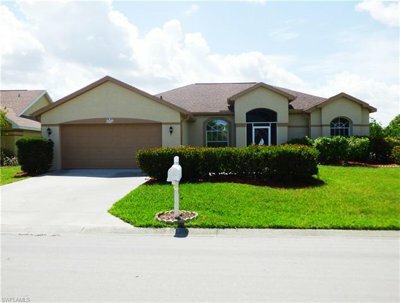 After the housing correction, many SW Florida homeowners were trapped in their homes. They couldn’t make a move. They lost so much equity they couldn’t afford to sell, and they were busy working on their businesses too that may have suffered. As years have progressed, we’re seeing signs now that many homeowners are choosing to make a move. They finally have equity back in their home. Their incomes have returned to normalcy. Some wish to downsize, while others have growing families. Many homeowners wish to change lifestyle or prefer a different location. Whatever their reason, summertime is the best time for locals to address their situation. Our agent was correct. Summertime is a great time for home sales, if you’re present and working the market. The numbers don’t lie. Sales are happening in the summer. The only real question is who’s going to make them. I remember hearing an agent say years ago that nobody wanted to buy in Lehigh. Really? I looked in MLS and found there were lots of sales in Lehigh, so clearly somebody was buying there. The truth is, that agent didn’t want to sell in Lehigh because they didn’t know the market, it was too far out, or they didn’t like the price point. The reality is that agent found a way to justify why not to sell. It’s like the argument that nobody buys in the summer. If you want to tell yourself that, then indeed sales will be down for you, and you’ll be right. Many sellers need to sell in the summer. Realize that home sales occur all months of the year, and really any month is a good time to sell if your home is priced correctly and marketed heavily. Sure, a hurricane might disrupt a month here or there, but overall, we have a pretty stable and steady market. 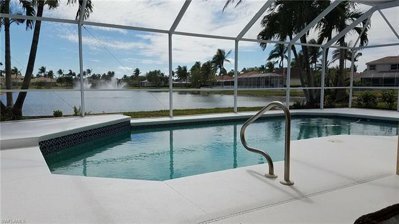 Home prices in Southwest Florida have been stagnant for the better part of a year now, but nobody believes it because headlines tell us how wonderful homes are appreciating in Florida. We were waiting to see how season went to see if that trend would continue. 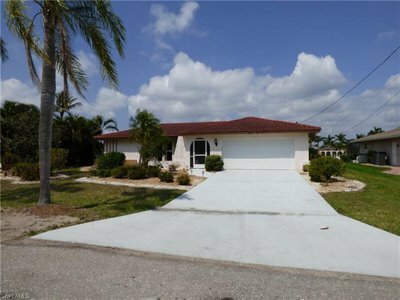 What we found is more of the same, SW Florida home price gains remain elusive compared to Florida in general. 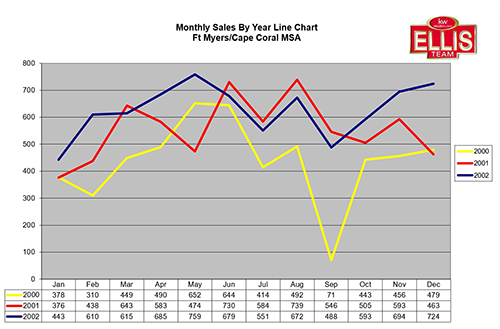 The Cape Coral- Fort Myers MSA median home prices increased .6% in the 1st quarter compared to 9.7% statewide. Our condos and townhouses showed no price change whatsoever from last year, compared to 7.8% gain for the state. 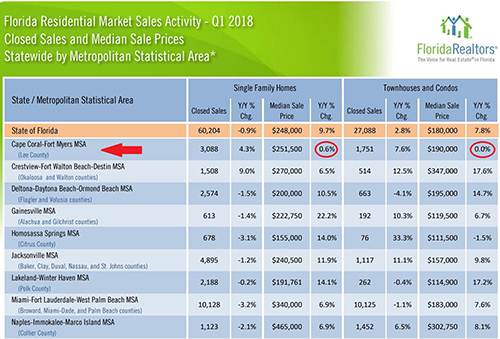 Cape Coral-Fort Myers is the 6th largest MSA in the state, and yet each of the 5 larger MSA’s all had gains of 4.8% or better. Some much higher. 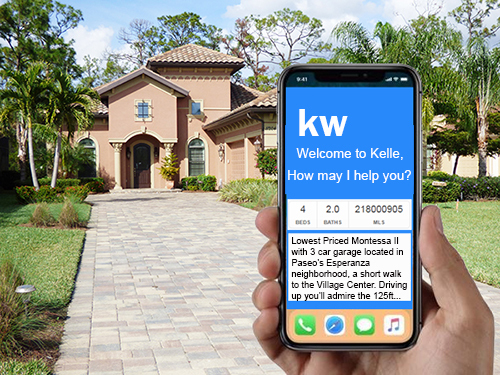 We go on listing appointments where the seller believes their home has appreciated 9% in value each of the past few years. Unfortunately, if you interview enough agents you will find one that agrees with you and takes the listing. Getting the listing isn’t the end of the sales process, it’s simply the first step. The seller sets the price and the market determines its value. If a seller sets the wrong price, one thing happens, doesn’t it? You guessed it, it sits on the market like a lonely school child watching all the other kids play. Oh, it may have some friends. Misery loves company. They hang out with all the other kids who have overpriced their home too. The strange thing is, nobody really wants to be in this club. So, they turn on each other, and start lowering their prices to get out of the club. Each watch what the other is doing, looking over their shoulder each time they make a reduction. The only problem is, they’re looking the wrong direction. They should be looking at all the kids playing. Wherever that group is, that’s where they should head. While they’re busy looking over their shoulder at where they’ve been, their eye still isn’t on the market. It’s looking backward instead of forward. The market rarely sits idle. It is moving. While they’re looking over their shoulder, the moving target in front of them just moved someplace else. Wouldn’t it save so much time to just find that group of kids on the playground and get right in there? Skipping a half mile behind them means you did spend time on the playground, but when recess is over, you never had any fun. If you’re going to the trouble of placing your home on the market, you want results. The quicker you get there, the more fun you have. If the market is on the move, you never want to get caught chasing the market. Chasing will not only wear you out, it can cost you money. When all the overpriced homes figure it out and finally make their move, you now have more competition. Setting your home price correctly upfront and reacting quickly if it doesn’t sell is a recipe for faster to the fun.